Well, that's it basically. We found out on 10.30 that we were 5 weeks and 6 days along. We got to see our little tadpole and see the little heartbeat fluttering away. It was an absolute miracle! It was a disappointment to hear I was so early on but still a blessing. I had been hoping for the 10 weeks our doctor guessed at. Stupid false positive pregnancy test. She wanted another ultrasound within two weeks so we go again on the 18th of November. Hopefully, we'll get a more accurate due date. 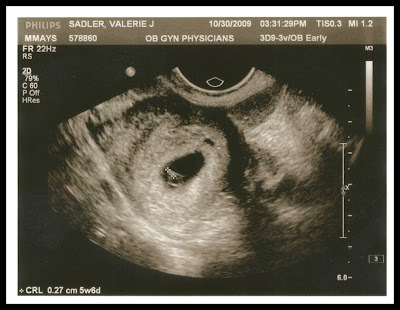 They are guessing at June 26th right now but that was based on her measurement of the blob on the screen. I personally feel she measured too small. You'll see on the picture that she measured the distance between her two x's. What about all of that stuff past that lower x? Seems like there was more to it than that. Who knows. We'll certainly not have to wait a year to find out! Nausea is getting more and more intense by the day. I miss enjoying food! Few people in the world love food the way we do! C'mon 2nd trimester!! !